For years I’ve opened the June issue of our newsletter by sharing our excitement for the annual SuperFloral/IFE Show in Miami. I’d give a sneak peek at our plans and products, remind you to come see us, even invite you to a party we planned just so we could reconnect and catch up. Good times, great memories. Make no mistake… we still love a good time as much as the next team – and you know we love the personal relationships we’ve forged over the years. But in true Dos Gringos style, we’ve decided to mess with the status quo in favor of our clients. We’ve determined that the time and resources typically put toward SuperFloral are better spent on trips to see and visit with Y-O-U. That's right, you can run but you can't hide. We're coming to see you in person. Well, as many of you as humanly possible. And we won’t be empty-handed. We'll be bringing the results of a consumer study DG commissioned to help all of us learn more about consumer behaviors and preferences within the floral industry. The information is interesting and insightful and could have a great impact on how we work together in the future. While the cat’s away, the mice will not play. As I hit the road, my team is working on a number of summer projects. Marco Rivera is knee-deep in planning for several client-specific shows we’ve been invited to. Aaron Motola is in fall planting mode, buying seed and getting the ground ready for the autumn harvest. It’s not too early to be thinking about October! Let us know your product hopes and dreams before it’s too late. Gabe Gill is always cooking up ways to make the plant work better and faster at the highest quality standards. 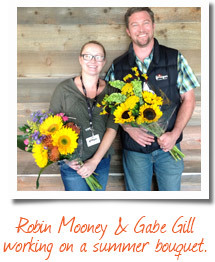 Mark Young continues his work on our forecast program, and Robin is rocking some brand new bouquet designs for 2013. I do have one piece of bad news this month. 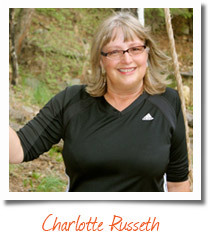 After 36 years of giving her heart and soul to the floral industry, Charlotte Russeth is retiring. A great asset to this team and a beloved member of the family, Charlotte wants to hang out with her husband, visit family scattered around the globe, and take advantage of the infinite outdoor activities in her home state of Colorado. Hard to argue with that, right? Charlotte has the last word in an interview below. 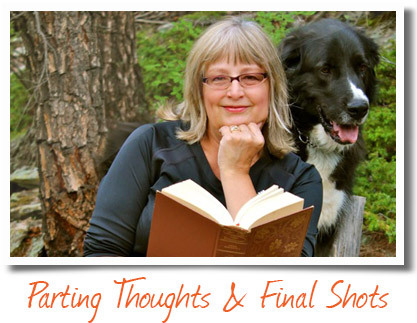 Please join me in wishing her a fond farewell and a wonderful retirement. There’s no one like her. What did you enjoy most about Dos Gringos? I wanted to work for a west coast grower. The products are unique and special. When you add the innovation that DG promotes, you’ve really got something. “Just Adds” took roses from a cost-prohibitive item to a commodity available to everyone. Cup of Sunshine and Half Palettes were fun to promote and sell. The personality and passion at DG are second to none. They’re not afraid to jump out from the crowd and put resources into something innovative. How does DG maintain the momentum you created? Bouquets and Consumer Bunch programs. Mass markets need more of these. Dos Gringos has thoughtfully and purposely expanded its product line, and Robin has a great eye for design. People will look to her for direction and inspiration. With quality, processes, and people, DG is set up for success in bouquets and Consumer Bunches. Education. Americans don’t consume flowers the way Europeans do. Building these numbers requires a lot of education about the value and the beauty of flowers. California flowers and foliage are interesting and gorgeous, but we need to spread them across the country; we need to get them all the way to the East Coast consistently and at high quality. We’ve got to spread the word. Ranunculus is great, but stores aren’t used to it. We’ve got to change that. No one does them better than DG. Once we started shipping them in a “sell” stage, it changed the way the industry looks at Sunflowers. With all the variety and color DG offers, this item will be hot for years. Jenny Butterfass will take over my responsibilities. The great news is that she’s right with the team, in Vista, CA. It doesn’t get more hands-on than that. She’ll do a terrific job, and I urge you to reach out to her. Retirement sounds heavenly. Anything about it that worries you? I’m worried about missing my peeps and being able to “turn off” my drive for customer service and quality. I’ve always prided myself on excellent customer service, which often meant being tied to the computer 10 hours a day. Now as I take advantage of kayaking, biking, hiking, snow shoeing and rafting, being away from deadlines and responsibilities will take some getting used to. I’ll miss the day-to-contact I had with like-minded professionals. Donated Sunflowers, which were sold by the foundation, contributed $2500 in scholorship money to the students chosen by Chelsea’s Light Foundation and for the family of a local athlete who passed away suddenly. 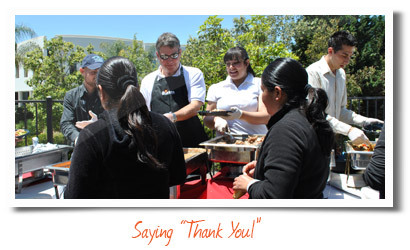 Jason personally serves lunch to Teammates at the Staff Appreciation Luncheon where a good time and good food was had by all!